Directions: In a quart-sized mason jar with a tight-fitting lid, combine the first 10 ingredients. Shake vigorously to blend and set aside. If you don’t have a jar, then a Pyrex bowl can be used with a whisk. The cream cheese needs to be cold enough to be firm for cutting, so move from the refrigerator to the freezer for about 5 minutes before you’re ready for it. Cut the block of Cheddar cheese to form stackable rectangles or squares and repeat with the cream cheese. 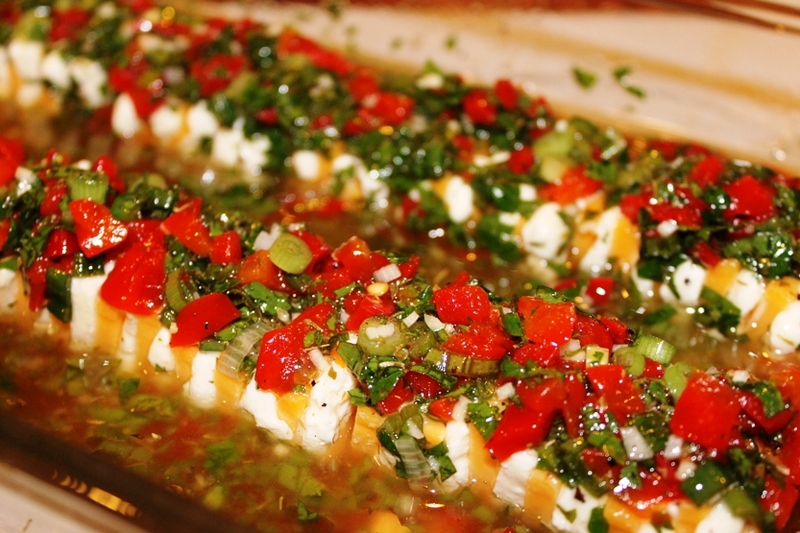 Arrange cheese squares alternately in a shallow baking dish. Shake marinade again and pour over the cheese squares. Cover and refrigerate for at least 6 hours or overnight.